Open Revolution: Who Are We? Not my illustration, but suitable here. 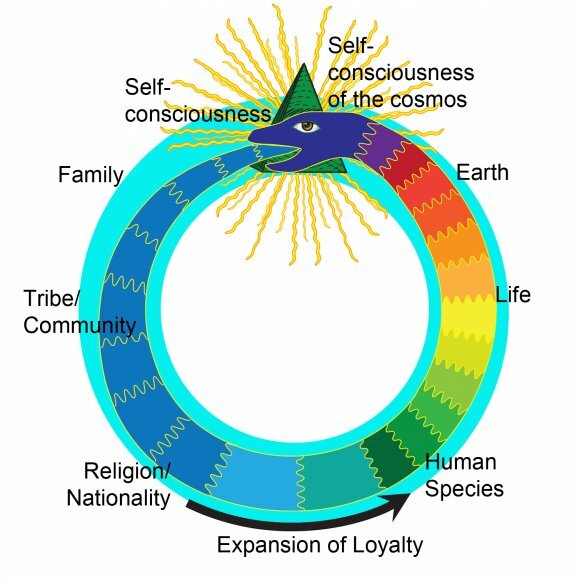 Human Identity Uroboros. Credit line: Nina McCurdy. Thanks to Nancy Abrams and Joel Primack for the image and their inspirational Ted Talk. The answer's different for everyone, and that depends on how far out you can feel. There's only one you. Whether you're 230 lbs or 115, it counts the same on the census. One. 'Who am I?' is a relatively straightforward question. The question 'Who are we?' is much more difficult to answer, because the 'we' changes based on context, and is difficult to pin down. You don't often hear this question asked but it's implicit everywhere. Are you one of us? We're adept at picking up social cues for this sort of thing. Very few people are so selfish as to only care about themselves. We'll go to great lengths to take care of our families, for example. The next step up is your tribe or your community. This is the level of loyalty that all cheers for the same hometown hockey team. It's also the reason that, all else being equal, you should shop at stores in your own hometown. In fact, being loyal to your community would suggest buying from local businesses even if it puts you at a slight disadvantage. If everybody buys their books online, then your community doesn't get a local bookstore. If you don't support local businesses then you don't get the benefits that they provide, like the business taxes, local jobs, and economic activity that makes a community viable. Beyond the community, we are a part of our nation or religion. This is what brings the country together for the Olympics or War, or what can spark fundamentalist activities. Once we look beyond national or religious borders we can see that we're all human. The Declaration of Human Rights adopted by the United Nations in 1948 is a great example of what being loyal to humanity is like. Is the 'we' the group of all humans? Is humanity in it for itself? To take care of ourselves, we must also take care of the rest of the life on this planet, both for food, and for the myriad ecological services it provides. So it makes sense for humans, on the whole, to take care of all life and the health of the planet. When there are violations of this precept, look to see what closer loyalty is being honoured instead. Cutting down rain forest to feed your family can make sense if that's the situation you're in. Watching how others respond when faced with a conflict can help you figure out what groups they most strongly identify with. It can help you figure out your answer to the 'Who are we?' question too. Manicured lawn? You can do better.